These photographs first appeared March 26, 2000. Send your photographs for inclusion in this rotating gallery! Older, smaller whale(r)s have survived for almost 40 years in the wild, but sometimes show the scars of those years. This 1962 Whaler 13 Sport has just been captured and moved onshore for recovery. The inset shows the serial/hull number, "6405." 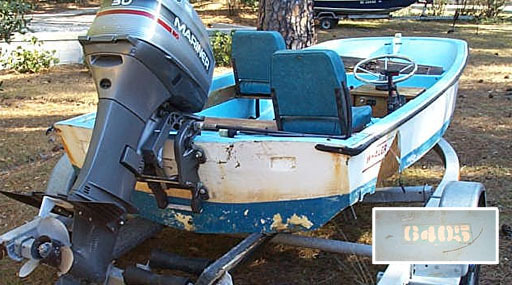 The original cut down transom has been filled to accomodate the longshaft 30 HP '96 Mariner, and the stainless steel wheel is probably an upgrade from the original. "I'm hoping to have it ready in 4-5 weeks," says owner A.J. Kress. Occasionally older whale(r)s show up and you're not quite sure what model they are. David Vergara wondered what this hull was. The interior is white with a raised bow platform from the console forward. The hull forms makes it definitely pre-1976. Larry Goltz though it was a Bass Boat, with a owner-added railing at the bow. 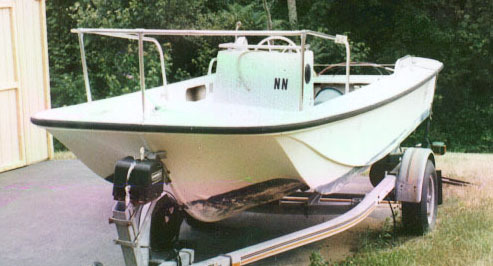 David contacted the factory with the hull number and found out it was made June 15, 1972 and it was a Bass Boat (in production 1971-1975). Pretty good records, and pretty good eye, Larry! Now we need to see the "after" pictures. How's that restoration coming, David? Behind the wheel: Tach(2), Water Pressure(2), and Cylinder Head Temp(2) gauges, plus Speedo and ignition switches. At the controls: Trim(2) and Engine RPM Synchronizer gauges. Below the controls: Voltage(2) and Hour(2) meters. Across the bottom: Switch panels(2) and Bilge Pump controls. 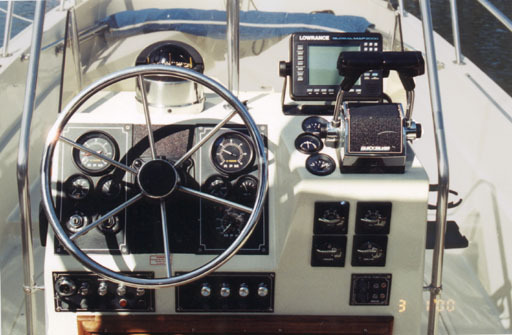 Across the top: Richie Navigator Compass and Lowrance Global Map 2000 combination DGPS Chartplotter and Sonar. The twenty-five foot Outrages are among the larger whale(r)s, and are definitely pelagic in nature. They roam the seas, and have evolved a very purposeful and functional propulsion and control system, as seen here. Speaking of helm consoles, I just hate those things that look like part of a GM car dash. Well, this one is definitely not your father's Oldsmobile. I get a sense of power just looking at it! Imagine cruising along thirty miles offshore with the twin 200 Mercs roaring back there on the transom bracket...awesome! 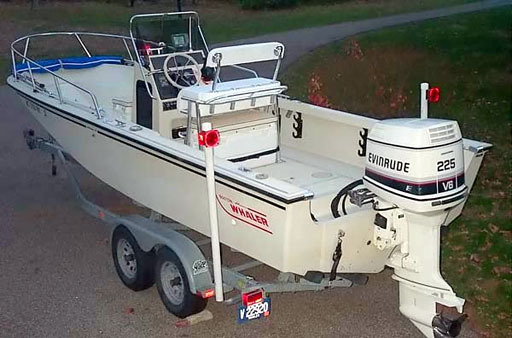 When this mint condition Classic Whaler was retired as a yacht tender, the father of these three kids bought it. Now they're out enjoying a day on the water under their Newport Blue Mills Canvas Suntop. 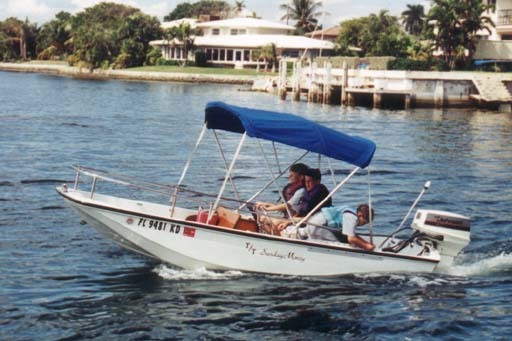 What other 13-foot boat would you let your kids take out for a spin on the intercoastal? I know when I was a kid, I loved those times I got to take the boat out without Dad along. Sport 13 with 48 HP! This Floridian whale(r) has developed an extra powerful propulsion unit. High speed movements may be necessary for survival in the dense aquatic population of the intercoastal waterway. Her interior features another variant on the seatback option; the railing doesn't seem to continue across the cockpit. Many whale(r)s have adapted to an amphibious role, equally at home on land or sea. In nautically named Anchorville, Michigan, Detloff brothers Dennis and Don (shown) have restored BOTTOM SCRAPER. 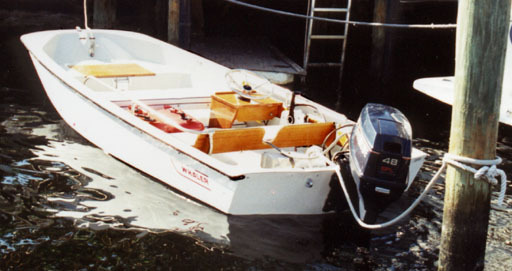 She features a 165 Hp Mercruiser stern drive powered by a straight-six Chevy and lots of newly replaced teak trim. This fine specimen of the Outrage genus has adapted to annual land migrations between northern Michigan and southern Florida by growing these rather prominent rearward-facing eye stalks. In summer months OUTRÉ can be seen in her marine environment, close to Neptune Island in Lake Huron's North Channel.